With spring in the air we’ve been excited to eat more raw veggie based salads, since during the winter we tend to crave cooked, warming veggies instead. 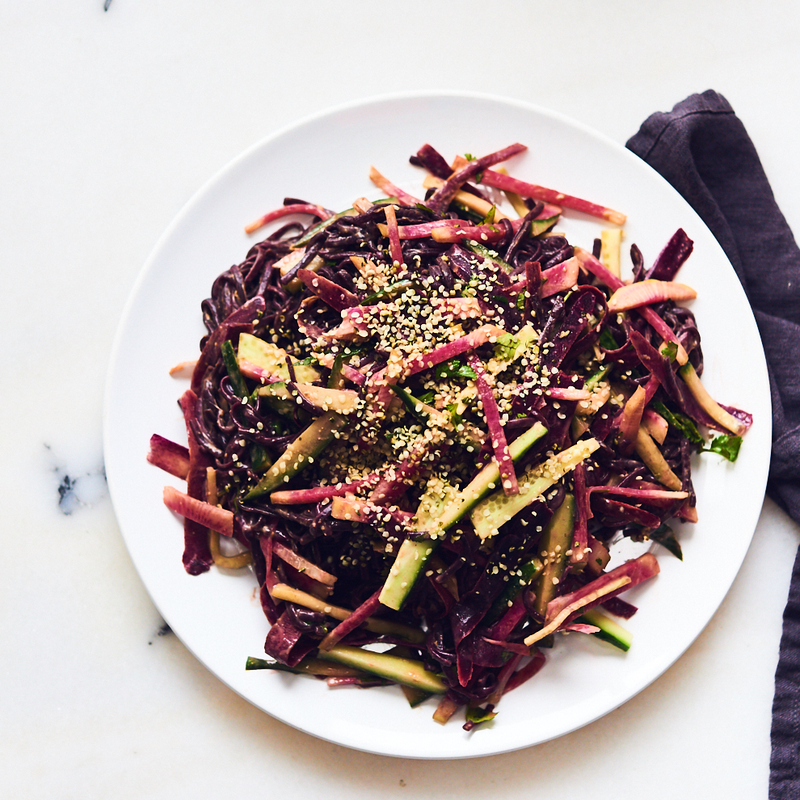 This soba noodle salad is the perfect combo of fresh, crisp veggies with tender soba noodles. You can always swap in other vegetables if you don’t have the exact ones listed below. Feel free to use regular orange carrots or the more common pink radishes if you can’t find the watermelon variety. And, if you don’t like cilantro, you can always swap in basil or mint. This peanutty and gingery salad will still taste great! Radishes are part of the cruciferous vegetable family (along with many other veggies, such as broccoli, brussels sprouts, and cabbage). These veggies contain a compound called glucoraphanin, that is converted into sulforaphane. Sulforaphane is known for its antioxidant and inflammatory properties and many studies have been done to research suloraphane’s neuroprotective effects by signaling the Nrf2 pathway in the body (the Nrf2 pathway protects cells from oxidative stress). You can easily enjoy radishes in this recipe and they truly add the perfect crunch! 1. Cook the soba noodles according to the package instructions. 2. While the soba noodles are cooking, prepare all the vegetables. Whisk together the ingredients for the sauce in a small bowl. You can add the water gradually until you get a consistency that can be poured easily. 3. When the soba noodles are cooked, let them cool down or you can run some cold water over top of them. Then drizzle a bit of extra virgin olive oil, avocado oil, or toasted sesame oil over top of the noodles to keep them from sticking together. 4. Combine all the ingredients in a large bowl. Toss together with the sauce.